I didn't really use the Desktop that much, but decided to use it lately. Now I've found an issue with copying files from the Desktop to any other location. Here in this screenshot I tried to copy a new file to my flash drive https://i.imgur.com/QEPiNwQ.png The error doesn't really explain what's wrong and I failed to find any info on this weird issue. Can someone please tell me what's wrong here? Why would it tell me that the file doesn't exist while it's clearly there? Oh, hmmm. This is strange. I can copy files from the desktop just fine if I use a file manager. I still don't understand why it wouldn't work if I copy things directly from the desktop. There's nothing more cheaper for politicians than human life. Yes it is weird but so is the concept of a desktop itself weird since typical computing possibilities in terms of its strengths is managing this kind of effort with commands on files and folders. but that probably isnt the problem here. How do you start Xfce4? A little bit better explanation than "I tried to copy a file from the desktop" would be appropriate, if you want a real answer. What created the file called "new file"? Had the process that created it completed? How did you try and copy, ie drag'n'drop? Well just to point out the obvious here, which is that all of the DE's whether that is Xfce, Gnome, Mate, Cinnamon, KDE are all pretty much known for having problems like that. The question is if you want your features to work all the time and be the most stable, then it really isn't a good idea to install any of them. The situation you described could be a lot of things, but whether or not the problem is specific to xfce, which is probably is since xfce is managing the desktop, but the larger issue with any desktop environment gives up the control of things that could be done better according to your specific needs. Say desktop icons, which is the goal you are after if I read it correctly. The only truly working solution that is both relatively stable (meaning won't break) and also efficient/easy to include is oddly enough doing without the DE altogether, and using a more lightweight application for window management like Awesome, which you can then add icons to the desktop with ROX (I believe). Awesome is a small wm that will manage the X session for you, but the problem if you are used to all the frills, bells and whistles of a xfce environment then this is not really what Awesome is, in terms of a good looking gui. But then again there is nothing as buggy in any computing environment than gui. The other thing you might try is downgrading packages, but you need to begin providing some more information. Assuming the problem was not solved that is, can you please post the output to emerge --info and emerge -pv xfce-base/xfwm4, which might help to make aware what branch of software you are using, along with what version of the software you have installed for the WM. 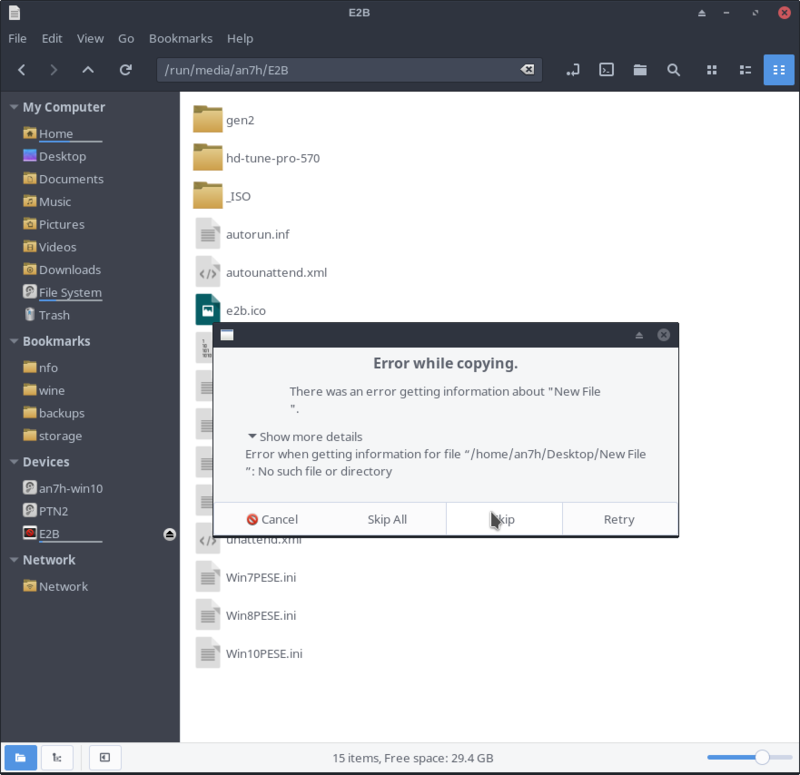 Maybe also do a quick version check with Thunar, the file manager that should be also responsible for the desktop icons to the extent that you are going to be using drag n drop copy techniques. NOTE: Lastly, as anon-e-moose mentioned and it is important to know that any file you use to test the functionality should be described better or shown and displayed to rule out the possibility of some other problems like a corrupt file, etc. The last thing you want is to be finding out that the reason for this little bug is you have a corrupt file system, but I guess it might be worth visiting in case that problem exists and could be fixed. It's not a big deal. I'm using PCmanfm, and works fine now. There's just no time to troubleshoot this small issue, although the main reason I switched is because Nemo pulls in pulseaudio, which I don't want to use. Instead I've got apulse + alsa, which works just fine for me. Good job! I completely agree not worth troubleshooting so good work finding an alternative solution. If you run out of good optins later and have to reconsider try caja is the Mate desktop file manager which i am not sure but i dont think it pulls in pulseaudio could be wrong about that. But also to clarify you are aware of the difference between installing packages and running them as an application and the fact is Nemo could pull in pulseaudio but the never really need it in terms of not breaking down without that Meaning you could maybe get away even with emerge —unmerge pulseaudio even after installing Nemo...if that is the preferred GUI tool of choice for now. Meaning you could maybe get away even with emerge —unmerge pulseaudio even after installing Nemo...if that is the preferred GUI tool of choice for now. The issue here is not that it pulls in pulseaudio really, I can disable pulseaudio later. Yeah, sure there's going to be a few packages I don't really need, but that's okay as long as I can disable it and I don't have to integrate pulseaudio into everything else with a use flag or something. The issue was that with pulseaudio I get alsa-plugins pulled as well, and it is impossible to get apulse and alsa-plugins installed at the same time. The reason I needed apulse is for Firefox, because without pulseaudio it would refuse to play audio. Anyway, now I changed my browser to Chromium (because it's faster), and it works just fine with alsa, even though it also pulls in pulseaudio. Another reason apulse didn't work out for me is that some programs didn't really understand apulses pulseaudio emulation, so they wouldn't play any sound at all (like the Dolphin emulator). I swithced back to Nemo, installed another browser that works with alsa, and just disabled pulseaudio, and it works just fine now. Not too sure that I agree with the logic, since 90 percent of the complaints to do with Pulseaudio seem like people just claiming that it causes problems when perhaps the main problem it caused is actually the fact that they didn't use it correctly. If I had to choose between a Google Chromium browser using ALSA player or some piece of sh*# tool like a 1980's browser that used pulseaudio I would still use pulseaudio. But that's just me I don't like the non-sense design of it, and I hate the overhead that seems to always come along with anything that has the google name associated. By the way Firefox isn't the only application that does things like not offer direct hardware support to audio in Linux. There are many other useful applications that do as well.